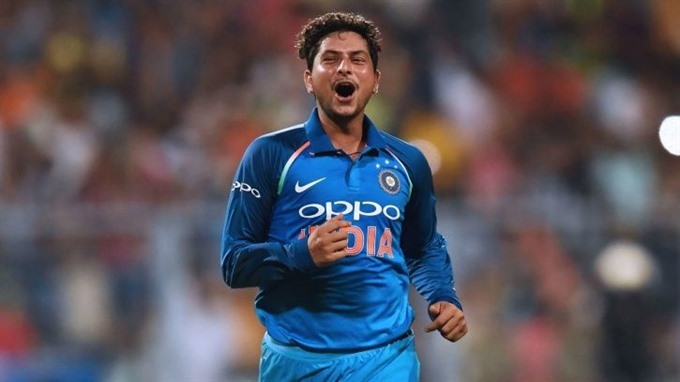 MANCHESTER — Kuldeep Yadav claimed his maiden Twenty20 international five-wicket haul and KL Rahul struck his second century in the format as India began their tour of England with an impressive eight-wicket victory at Old Trafford on Tuesday. Left-arm spinner Yadav finished with 5-24 as England were restricted to 159-8 after they collapsed from 94-1 following India skipper Virat Kohli’s decision to insert the hosts at the toss. England’s form in ODI cricket has seen them climb to number one in the world in that format, but their T20 side remains a work in progress. India’s fans were on their feet waving their flags on a sun-drenched evening in Manchester when England skipper Eoin Morgan (7) skied a delivery from Yadav and into the hands of India counterpart Kohli at deep midwicket. Bairstow was outfoxed by Yadav’s wrong ’un and stumped by Dhoni before the keeper repeated the trick with Root. England’s lower-order batsmen then came and went quickly — with Buttler also undone by yet another googly from Yadav as he was caught straight down the ground by Kohli — although David Willey’s 29 off 25 balls boosted the hosts’ total. India’s batsmen oozed class as they went about the chase in a confident fashion after Willey removed Shikhar Dhawan, with Rahul in particular showing his quality as he brought up his half-century off 27 balls with a late cut off Adil Rashid. Where Yadav had been imperious, England’s spinners appeared toothless by comparison with Rashid and Moeen Ali only rarely able to trouble the tourists.